With the world’s motorcycle manufacturers feeling the enormous weight of progress and the ever-increasing pressure of emission regulations pushing down on their leather-jacketed shoulders, it’s no surprise that many of the bikes we’ve been reviewing of late have bitten the Euro 4 bullet and made some fairly big changes to their powerplants in order to woo Mother Nature and please those pesky EU bureaucrats in Brussels. But Moto Guzzi are amongst a handful of the big makers who have battened down the hatches of their little air-cooled castles and dug in for the long haul to 2020 when Euro 5 rules will kill off the genre for good. 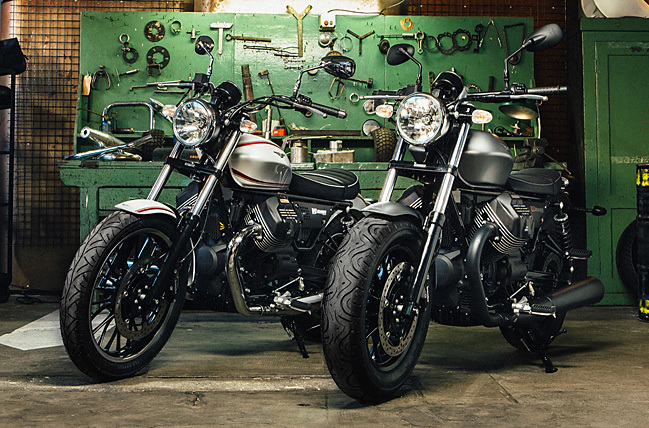 Which brings us to this, Moto Guzzi’s latest release, their ‘youth-orientated’ V9s, the ‘Bobber’ and the ‘Roamer’. But are they just dinosaurs teetering on an ever-decreasing piece of sea ice, or buy-them-now-before-its-too-late motorcycling classics in the making? Let’s find out. 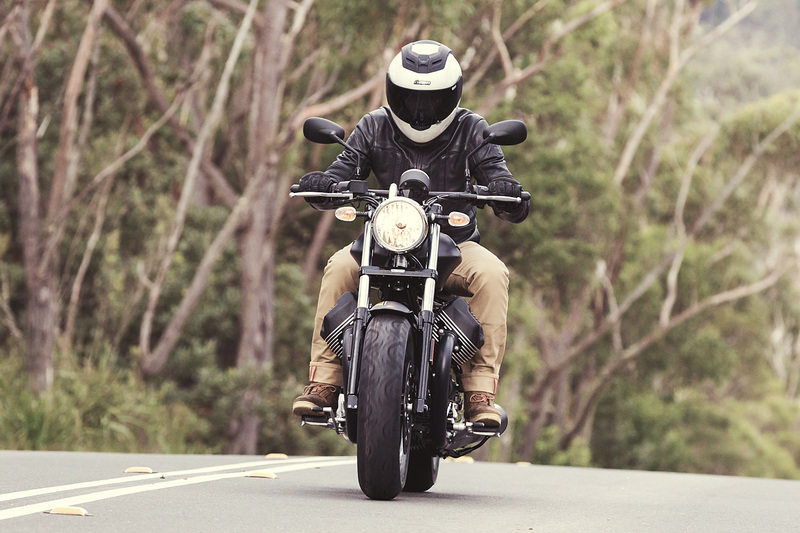 It’s winter Down Under, and Moto Guzzi Australia’s strada di selezione for their latest launch was the always enjoyable roads located on the New South Wales Southern Highlands, about two hour’s ride from Sydney. The area is known for its resemblance to traditional English countryside, with a correspondingly high rainfall, plenty of cows and a long-standing dairy industry producing some of the country’s best milk, cheese and beef. Our route would take us from our coastal base at Kiama, to Mossvale and Bowral, the childhood home of Don Bradman, cricket’s greatest batsman. After a brief coffee stop, we would then head south to Kangaroo Valley for lunch, and back to Kiama via the route’s southern loop. 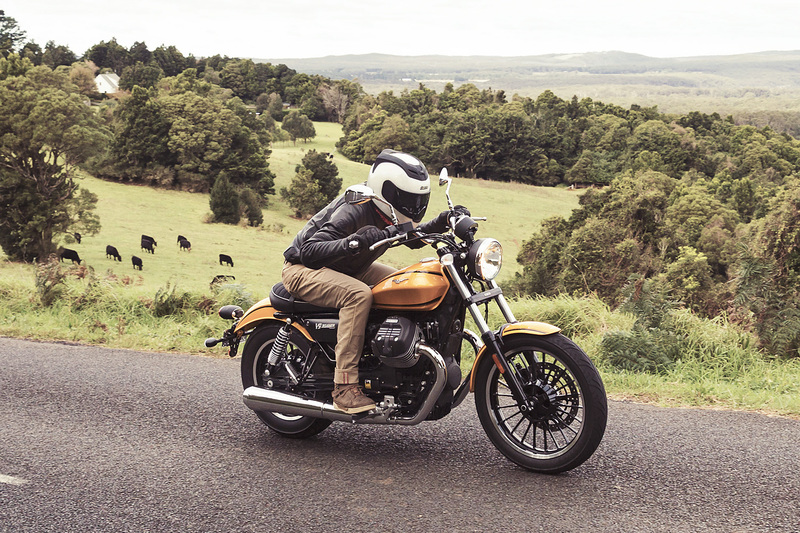 Taking in rolling hills, damp rainforest, mountain roads and decent stretches of meandering highway, there was no doubt amongst the assembled riders that the route would be a decent test for the bikes. The fact that the weather had gone to town on the whole east coast of the country in the preceding 48 hours also mean that wet roads and unusually large amounts of debris would double down on the challenge. A dinner before the big day overlooking Kiama’s seaweed-covered cricket oval was a surreal reminder that we’d have to be on our toes. After a quick hotel breakfast (ah, convey-belt toasters!) we were ushered down to the hotel’s forecourt and to a neatly stacked array of the pristine V9s. With two ‘Bobbers’ (the ones with the fat tires, above) and three ‘Roamers’ (the ones that look like California in the ‘70s, below), the technical briefing began. 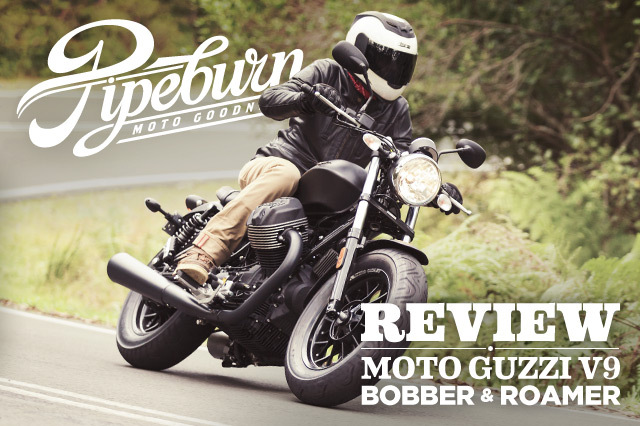 Unlike the marked differences between the Yamaha bikes we reviewed recently, The Guzzis are much more, ‘one bike, two variations’ in their execution. To put it rather simply, the only real differences between the two are the wheels, fenders and the handlebars. 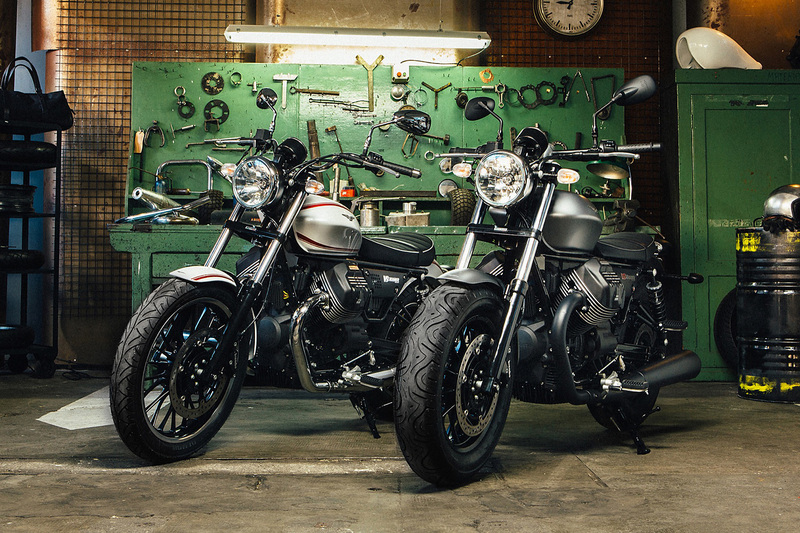 Specifically, the Bobber has cut fenders, a 130/90 – 16 front as opposed to the Roamer’s 100/90 – 19, and flatter bars. The rest of the bits are shared, including the new V-twin donk, a designed based on the old block from the V7’s engine, but with a redesigned top end to increase capacity. It puts out 55hp at 6,250 rpm and 62 Nm (46 lb-ft) of twist at 3,000rpm. While it’s easy to assume that the capacity increase from V7 to V9 would be 200 cubic centimetres or there abouts, the reality is a meagre 109cc increase due to the fact that the ‘7’ is a generous 744cc and the ‘9’ is a rather meagre 853cc. 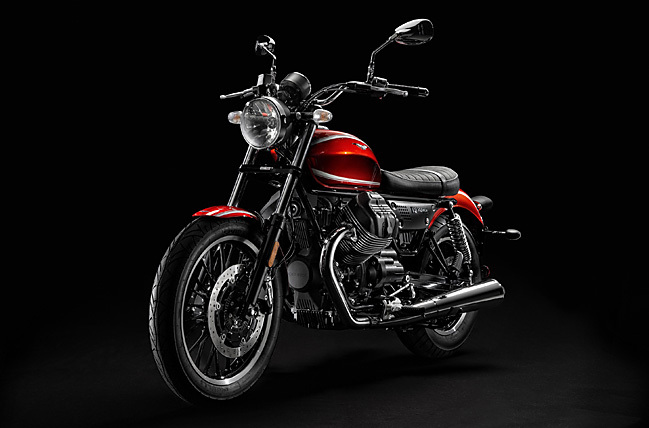 This is clearly reflected in the bike’s specs, with a gain of only 7hp and 2Nm (1.4 lb-ft), and the on-road acceleration, which was pretty much indistinguishable from the V7 model. Then there’s a 6-speed ‘box (with a taller 1st and a shorter 6th gear), traction control (with two settings and shut-off-able) and dual-channel ABS (not shut-off-able), a programmable shift light, a Brembo 4-piston front caliper, a USB socket, non-adjustable front shocks and twin rear shocks with preload adjustment. And for a bike that just barely manages to read 200kgs (440lbs) when parked on a set of scales, there’s nary a piece of plastic to be seen anywhere. And the ‘Roamer’. ‘70s much? The bike’s tank is its defining feature, both in these shots and in the metal. ‘70s looks, backed up by the Roamer’s very Milwaukee-looking paint, fenders and stripes (which all look great, by the way), left little doubt as to what the Piaggio designers had been looking at before they put pen to blueprint paper. While the Bobber’s black hues and jumping castle tires do lend it a touch of Shinya’s Zero-bobber looks, I was never in doubt that somewhere, back in Guzzi’s Mandello del Lario headquarters (or more likely in Piaggio’s new Pasadena design centre) there’s a bunch of pages torn from ‘70s issues of Easyriders magazine pinned to the studio walls. Of course, it’s only fair to mention that Moto Guzzi itself had more than its fair share of ‘70s West Coast action with its classic Eldorado 850 challenging Harley’s dominance of American police garages with the sale of many of the bikes to the LAPD in the ‘70s. But far from being just a fashion-led ‘wouldn’t it be cool’ decision made by one of the company’s design gurus, this influence runs much deeper than just the bike’s skin. 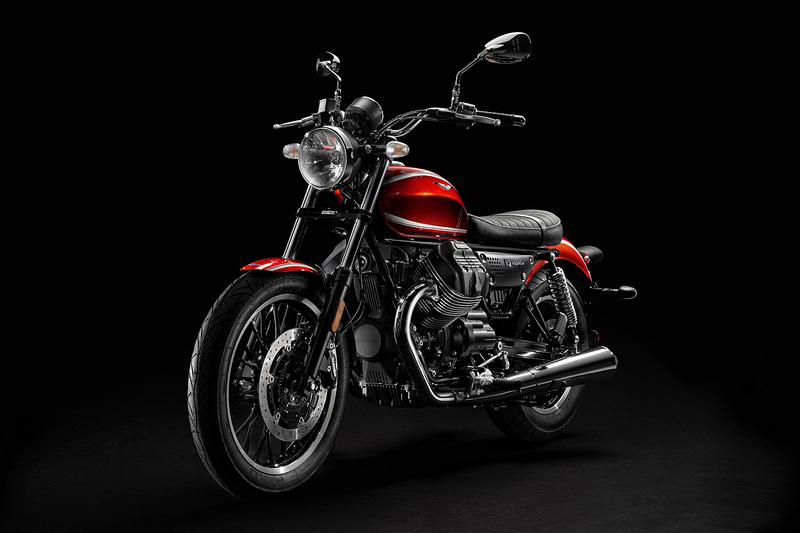 In fact, you could argue that with Harley Davidson and Moto Guzzi being the last two big manufacturers that are sticking to their air-cooled guns, this kinship is more than just coincidence. 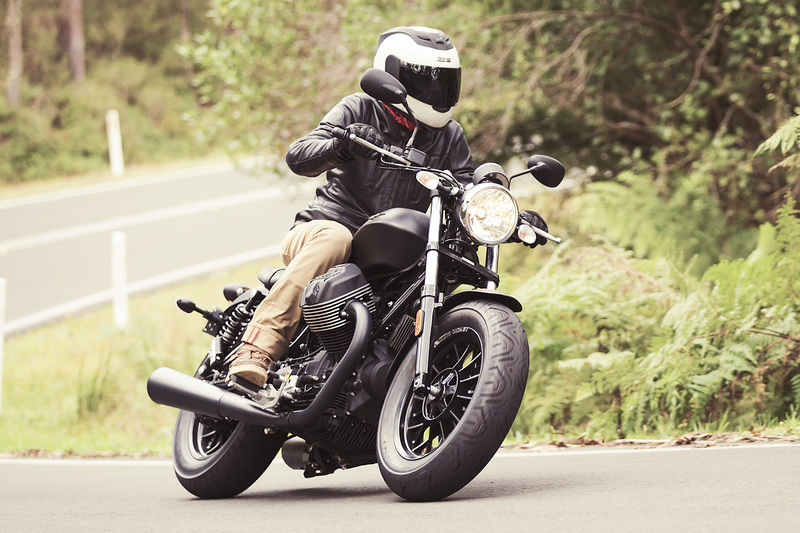 With a few V7 hours clocked up in the past, my initial impressions of the bike were familiar ones; Guzzi’s engines tend to dominate their machines, and this one was no exception. 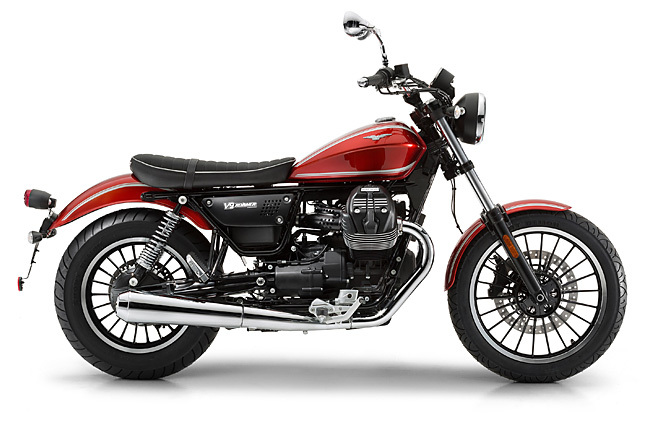 As I remember thinking the very first time I rode a Guzzi, their transverse V-twin is about as close as you can get to a good ol’ American V8 without welding on some tail fins and a cup holder. 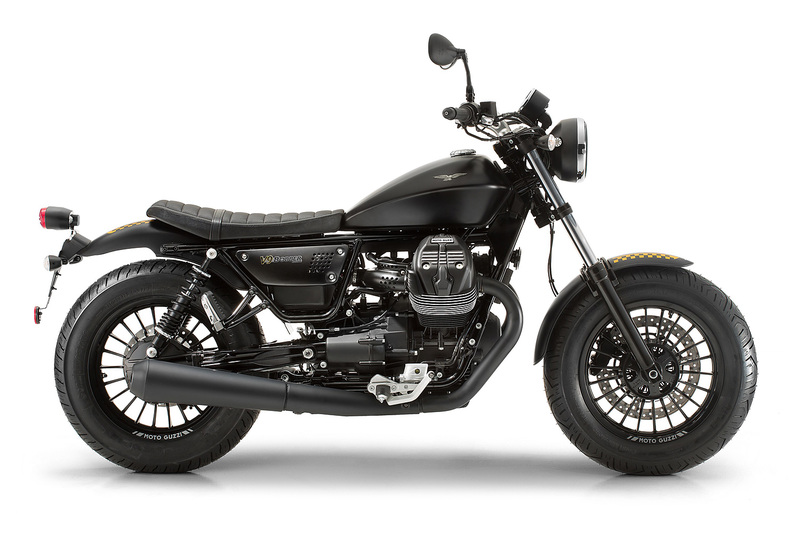 While the stock pipes that were fitted to all the press bikes weren’t overly chunky, I happen to know that a little extra folding stuff laid across your local Guzzi rep’s hand will grant you access to some after market pipes that will release even more V8 from this Northern Italian lump. Trust us when we say it’s well worth it. 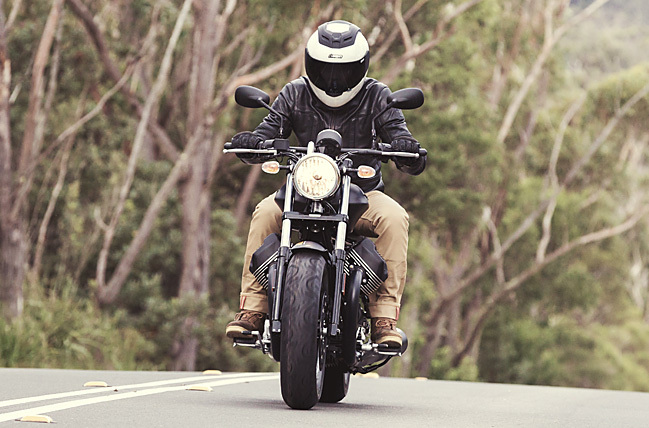 The rest of the bike tends to follow the engine’s lead. From the gear change and clutch to the feel of the switches and the starter motor, it’s all very simple and functional with a charismatic sprinkling of Italian agrarianism thrown in for good measure. Any rider coming straight from a modern Japanese in-line four couldn’t hope for a more contrary experience; it’d be like dating a Tokyo Physists one day and waking up in the morning next to an attractive yet rugged Italian dilettante sleeping in your bed. It’s vibey, it’s full-flavoured and what you see is very much what you get. Gear changes happened easily, but without the slickness that some of the bike’s competition exhibit. Drawing attention to this was the dial’s gear indicator, which seemed quite reluctant to display what gear I was actually in until well after I’d engaged it. Maybe the messages being sent from the gearbox were stopping for an espresso before arriving in the display? As you’d probably expect, the suspension seems to have been set up with a particular type of riding in mind. The clear American influences here may also shed some light on what this may be. Put simply, it’s a little on the soft side. And while no one on the day accused the bike of being bad in the corners, it was certainly not going to be entering any MotoGP events any time soon. The Roamer’s more svelte front tire and raised ‘bars certainly made the bike feel more willing while tipping it into the apexes, and my first few corners on the Bobber after swapping over saw me take some less than elegant lines while trying to figure out what the bike was most comfortable with. Once I had, there was precious little extra lean to be had before the bike’s hero blobs were touching down and creating visually exciting, aurally painful showers of steely Italian sparks to amuse the photographers and scare members of the general public. In fact, they touched down so soon, I’m not afraid to admit that I jumped when it first happened. As I’m sure our mate Sam Maclachlan also did when he managed to tear off his right peg after catching it on a cat’s eye in a right-hander. The sight of him standing on the edge of the road looking down at the Guzzi and holding a loose peg in his hand is an image that will stay with me for quite a while. 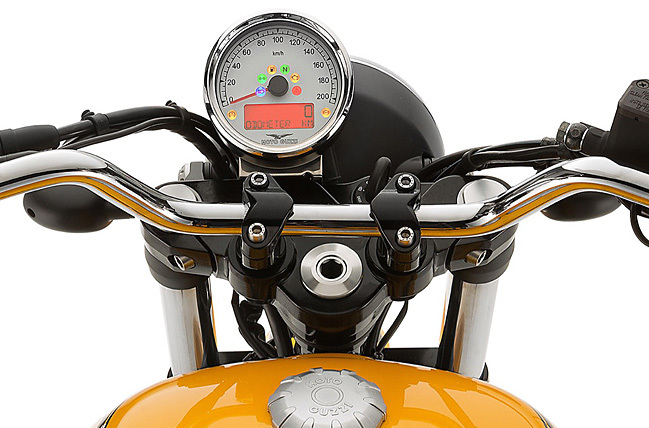 Apart from the decidedly casual gear change indicator, the rest of the bike’s controls were all well implemented and easy enough to use. Some fancy finger work on those buttons shown below lets you adjust your shift points, reduce or remove the traction control and check the air temp, amongst other things. 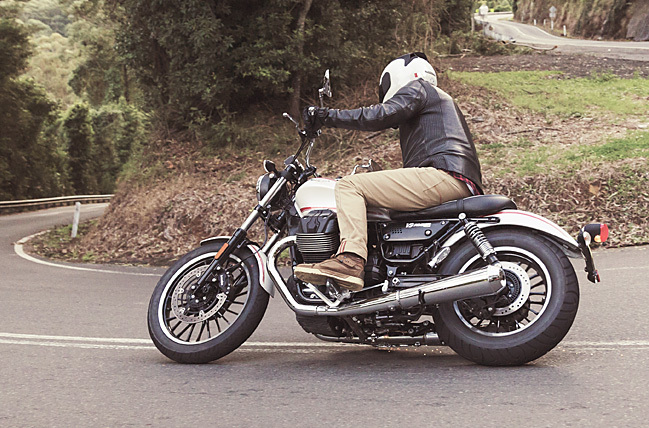 ABS, as is the case with most new bikes, is always there for better or for worse. The dial, with its jaunty little port-side offset has a decent, classy feel to it and goes a long way to remind the rider that this isn’t just any old plastic hack. My notes also contain a hastily scribbled reminder pointing to the fact that the bike’s start-up sequence seemed a little complex. Clearly my limited time on the bike meant I wasn’t overly familiar with the procedure, but once or twice I was left stationary by the side of the road scratching my head/helmet trying to figure out why the bike wasn’t turning over, only to find that one of the many switches, buttons or levers involved in starting the bike wasn’t in the correct position. While the bike’s key did feel a little cheap, I’m not about to deduct points for something that won’t really have an impact on your enjoyment of the bike on a day-tip-day basis. But something that definitely would impact your enjoyment might be, say, returning to your bike after work to find the gas cap missing and the tank drained of fuel. It seems a little crazy to say it, but the bike’s petrol cap isn’t lockable. The Guzzi guys, when quizzed about this rather weird oversight got a little sheepish and, to their credit, admitted that they too thought it wasn’t the best of designs. Of course, there’s lockable one available to buy off the accessories list, but the key for it isn’t the same one as used in the bike’s ignition. So you’re running the gauntlet of either having you gas nicked or losing the key for the thing and not being able to fill up when you run dry. It’s not a show stopper by any means. But we’re pretty sure that someone stealing all your gas when you’re miles from home would be. After a few hours at the helm of the various bikes, the seats started to get acquainted with my, how do you say, back Jar Jars. 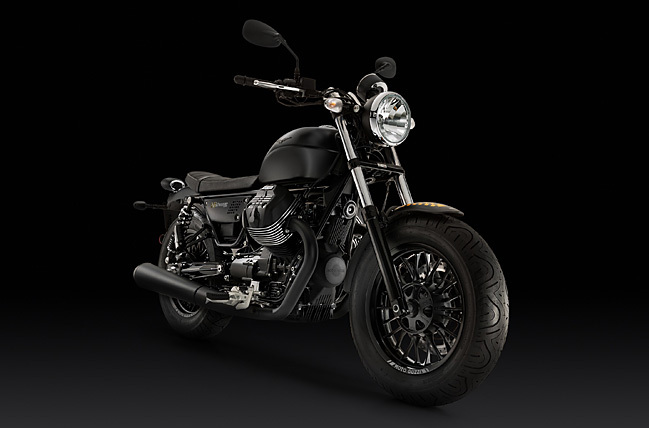 While Guzzi have provided adequate padding between my Mr. Binks’ and the bike’s ouchy parts, the more time I spent in the saddle, the more I realised that it was getting harder to find a place on the seat that felt ‘right’. While it never got to the point of discomfort, I’m not sure extended touring would be a do-able thing over consecutive days without cheeks made of considerably more that the wobbly flab I’ve been blessed with. I found relief in a move that I saw more than just myself executing on the day. With the passenger pegs down, a brief stretch could be had by just placing my legs back and up to relocate them on the improvised rear-sets for a moment or two. The shift in posture also allowed me to reposition myself on the seat for a minute or two and freshen up somewhat. I’m thinking of patenting the move and publishing a book. Maybe I’ll call it ‘Moto Yoga’. 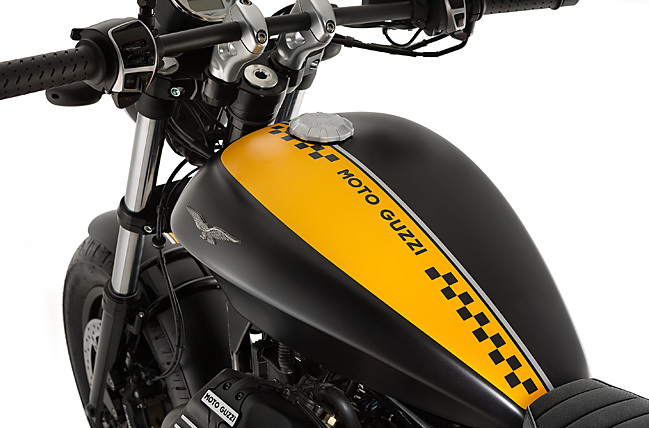 Or ‘YoGuzzi”. Cash preorders are welcome. Another thing that help get the circulation flowing again was the vast ocean of warm, flowing torque the bike was capable of dispensing at moment’s notice. As with any ‘vee’, the sheer weight of all that good ol’ reciprocating metal contained within the engine’s air-cooled walls means that there’s always a surplus of push for seemingly very little effort on your or the bike’s behalf. And with pretty much all of it available from about 2¾ rpm, it’s a bike that never feels out of step, or like you’ve caught it at a bad time. It just goes, and pronto. But heavy-handed application of all this mechanical motivation and you’ll likely wake the bike’s traction control system that will, like your mother in electronic form, call a halt to proceedings. I first noticed the TCS light flickering after I turned a tight, back lane corner and kicked it in the guts up a wet, leaf-covered hill . “Fair enough,” I thought. But a few more incursions by the system on sections of road that were clearly nothing more than a little damp had me switching the whole thing off at the next waypoint. Besides, with a solid but hardly overwhelming 55hp, it’s not like you’re taking your life into your own hands without it. And with that, we set sail back to Kiama and a nice, warm meal. Some extended dilly-dallying due to photo shoots meant that we were riding after sunset for an hour or so. I found myself with a tinted visor and no alternative but to hoist it skyward and squint into the wind to avoid mistaking a driveway for the main road and parking the bike on some poor family’s dinner table. 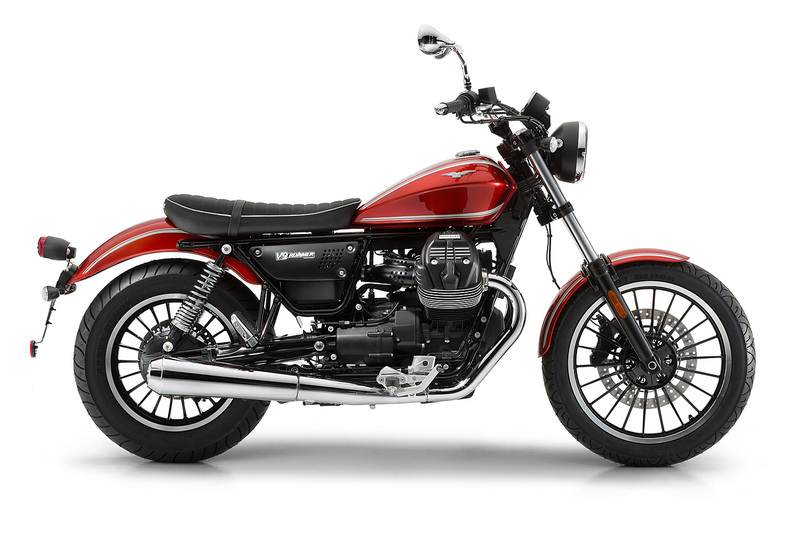 Luckily, the last bike I’d grabbed for the day was the Roamer that the Guzzi team had fitted with their saddle bags and windscreen accessories. While it got a few chuckles on the day and earned itself the nickname ‘The Bus’ thanks to everyone filling its pouches with spare gear, the screen did and admirable job of deflecting the blustery night air up and over my squinting eyes, allowing me to ride fairly comfortably at the 80km/h speed limits on the way back into town. As you can plainly see, the bike wasn’t perfect. Reviewing my thoughts on the thing after dinner and a few cleansing ales, I had a horrible sinking feeling in the pit of my stomach. The notes made me realise that I’d done pretty much nothing all day but list out negatives about the bike. The scraping of the pegs. The gas cap’s thief-friendly design. The tricky starting procedure. 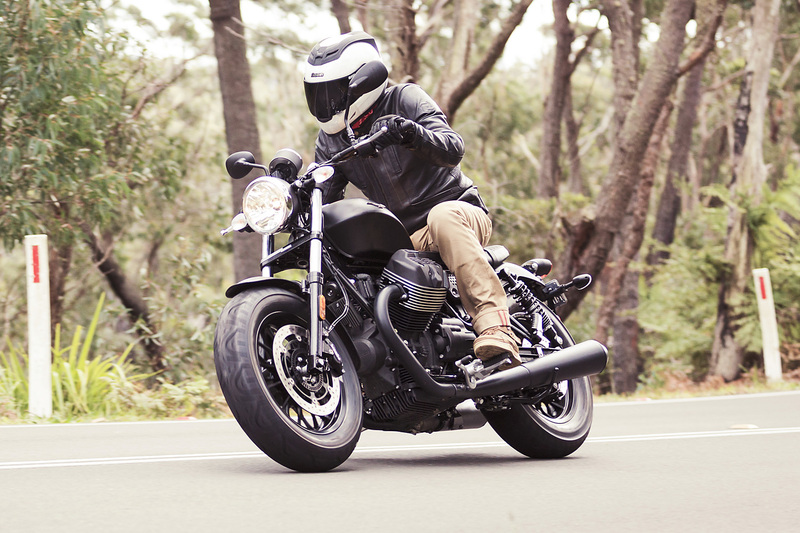 The intrusive traction control. It was beginning to look a lot like the bike was a dinosaur, and maybe one that was best off being left behind. 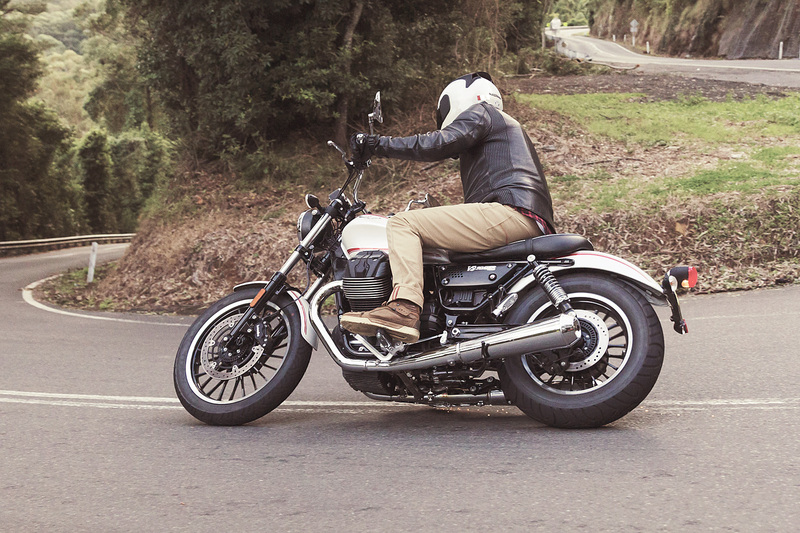 Right about now, you’re probably thinking that I didn’t really like the Moto Guzzi V9. ‘He’s going to trash it!’ I can almost hear the peanut gallery whispering it now. But if you did think that, you be wrong. Way wrong. Because despite me banging on about these relatively minor issues in my annoyingly opinionated ‘I’m a fancy bike journalist’ kind of way, I’m going to stand up and be counted as a bona fide, card-carrying fan of the V9. And why is that? I’ll tell you why. 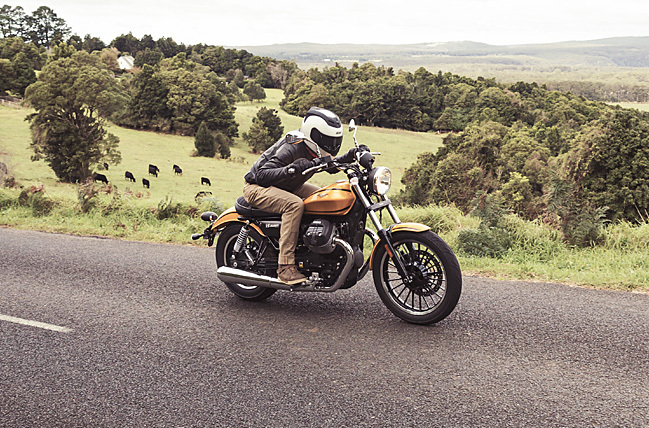 It’s because these days we see so many other manufacturers doing their best impressions of classic bikes that are really just styling exercises to lure the more fashion-conscious amongst us to spend our hard-earned to boost their bottom lines. 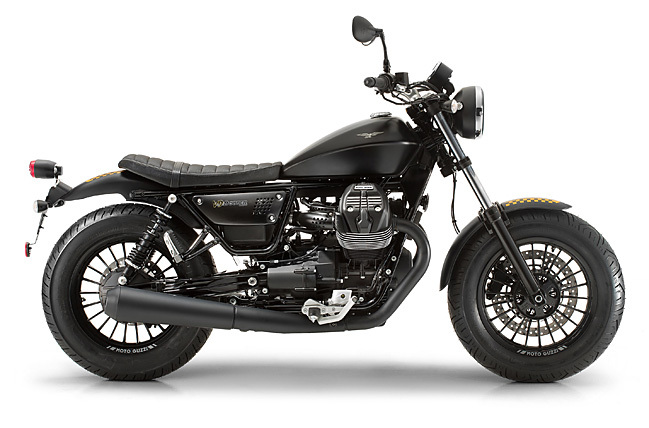 But what this bike, and Moto Guzzi in general do so well is to give us a bike that is not a new school bike trying to be old school, but rather a beautifully charismatic, honest-to-goodness new old school bike. It’s kind of like the Land Rover Defender of the motorbike world; it may not look that good on paper, but it’s still the coolest vehicle in its class by a country mile. You’ll have probably noticed that the word ‘authentic’ gets bandied around a lot these days. With a general rejection of all things artificial and a longing, especially amongst younger riders, for ‘real’ moto experiences, it’s still quiet easy to overlook the Guzzi for what it really is. 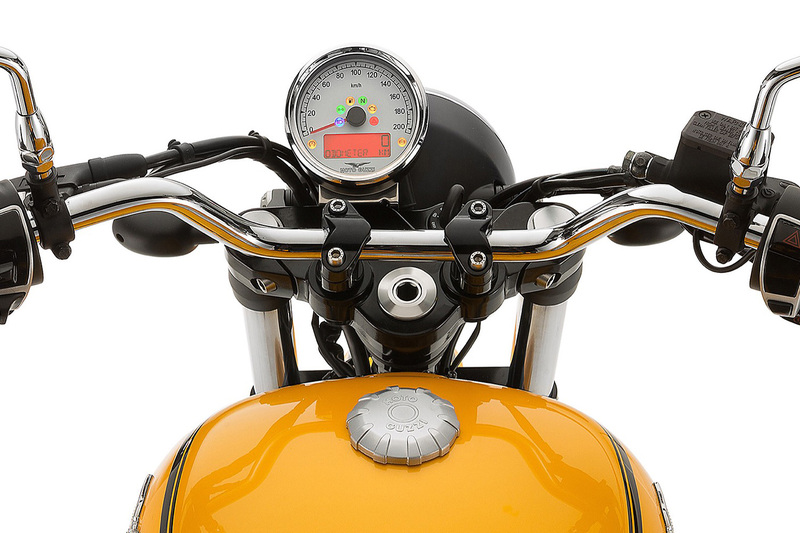 It’s a genuinely charismatic bike, and probably one of the last of its type we will ever see, made by Europe’s oldest and longest continuously running motorcycle manufacturer. The question is not whether the V9’s the right bike for you, but rather are you enough of a loving, swearing, crying human for it? Riding one is a raw and real experience that pulls no punches nor offers up any softly-softly accommodations for overly delicate sensibilities. It rocks and it rolls, it roars and it rips, and it laughs in your face when you try to talk about comfort, greenhouse gasses and lean angles. And then it lights a Marlboro, downs an espresso and winks at you. And unless you’re dead inside with an iPhone where your warm, beating heart used to be, you probably should smile and wink back, too. 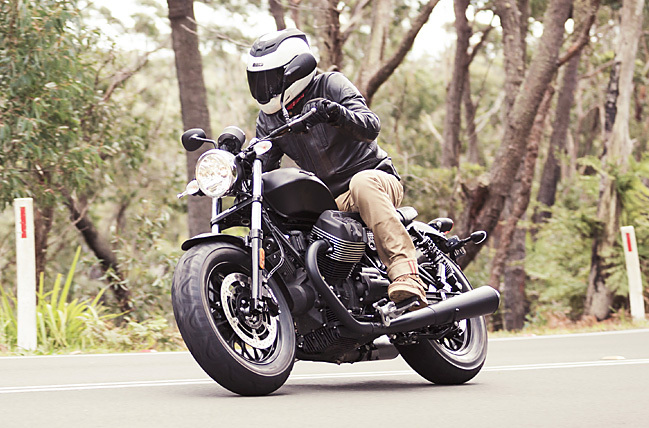 The fine print: In an effort to keep things as legit as possible, we feel it’s best to mention that Moto Guzzi Australia paid for our trip to Kiama to see their new bikes and also shouted us a few Peronis afterwards. Rest assured that if the bikes weren’t up to scratch, we’d have no problems in saying just that, and that we will always endeavour to give you guys the best reviews possible without fear or favour; Northern Italians bearing gifts included.